Curly hair is naturally drier than other hair types, so it needs extra hydration to look its best. The TRESemmé® Botanique Curl Hydration System is specially formulated to cleanse, condition and give your curls the extra hydration they need. Curls are left more manageable with a healthy-looking bounce. Professionally formulated with a botanical blend of shea butter and hibiscus and gently cleanse curls, The system gives the extra hydration they need and curls are left more manageable with a healthy-looking bounce. Ingredients: Aqua, Sodium Laureth Sulfate, Cocamidopropyl Betaine, Sodium Chloride, Butyrospermum Parkii (Shea) Butter, Hibiscus Sabdariffa Flower Extract, Glycerin, Parfum, Dimethiconol, Glycol Distearate, Carbomer, Gluconolactone, Guar Hydroxypropyltrimonium Chloride, TEADodecylbenzenesulfonate, Citric Acid, Sodium Sulfate, PPG-9, Trehalose, DMDM Hydantoin, Disodium EDTA, PEG-45M, Cocamide MEA, Sodium Benzoate, ethylchloroisothiazolinone, Methylisothiazolinone. 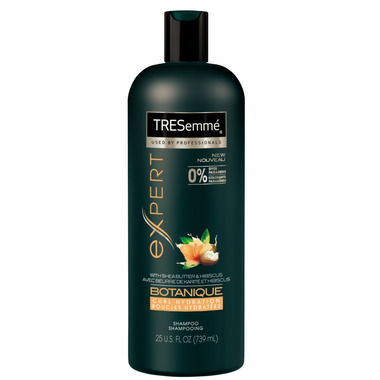 I really love this shampoo, It is just right for my hair. The smell is not too overpowering and my hair is soft and shiny.